Last month a dear friend, Therese Marszalek, stopped by with a beautiful birthday gift: a large pink bag filled with individually wrapped gifts. Like Charlie Bucket in Charlie and the Chocolate Factory who savored every nibble of his birthday chocolate bar, I opened only one or two of the gifts inside each day thus extending the joy of the moment. In the course of doing so, God placed upon my heart this month’s blog: return to and “unpack” the gift He gave to me in 2008: Good Morning God. This pamphlet holds scriptures and direction for preparation and protection for your day. I have learned from personal experience that if I say “Good Morning” to God the Father, Son, and Holy Spirit as soon as I wake up, and follow the steps in this pamphlet, God empowers me for the day. You can ruin a finely-tuned engine by using the wrong fuel or otherwise not following the manufacturer’s directions. You can ruin an oatmeal cookie by adding chili powder instead of cinnamon to the recipe. Adam and Eve brought death to the world and broke the relationship between man and God by disobeying God. It could have been over, but God had a plan. His plan’s Name was, and is, Jesus. The back panel of the pamphlet explains why and how to receive forgiveness for your sin, and to start the most amazing personal relationship with God—one you will never regret. Years ago, a teacher explained the difference between praise and thanksgiving as this: praise is about who the person is; thanksgiving is about what he or she does. As we learn more about God, we can incorporate that into our praise. To start, read Galatians 5:22 and 23. “The fruit of the Spirit is love, joy, peace, longsuffering, gentleness, goodness, faith, meekness, and temperance (moderation).” The Spirit is the third part of the Trinity, so we can praise God for being these. Lord God, I praise You that You are love, joy, peace, longsuffering, gentle, good, faithful, meek, and temperate. (As a believer and follower of Christ, the Holy Spirit lives in you. Therefore, the root of these abides in you also, waiting to grow.) As you get to know God better, your list of praises will grow. What a beautiful way to start the day! Through the Blood of Jesus, the Son of God, the devil has no place in you, no power over you, because of all that Jesus did for you on the Cross. In the book of Revelations, the last book of the New Testament, God shares how believers and followers of Christ overcome. That important verse is included here along with others that will help “make your day”. To build your faith and make it strong, speak these verses out loud, believe and claim them. The devil wants you to think you have no power and no choices. Those are lies. “…he is a liar, and the father of it.” (John 8:44) Binding evil and loosening the opposite in Jesus’ Name are empowerments from God Himself. Here you can learn what they are and how to use them. In the heat of the moment, carelessly, or with purpose, words can be spoken against us. All words count. Evangelist June N. Davis shared in her book, Scripture Keys Power Manual, that it was a major breakthrough when she and her husband realized that words spoken by others were causing them all kinds of trouble, including hindering their ministry. Those words gave the enemy—the devil—permission to come against them and against God’s work. Since they couldn’t control what other people said, they began daily breaking these negative words (curses). The results were a decrease of attacks by Satan and a surge forward in the ministry God gave them. God directed June Davis to pray for others before praying for herself. The scripture given here includes all people. This is serious business. God loves you SO much! Did you know He has sent angels and ministering spirits (yes, “good guys”) to help you every day? Be careful with what you say. If you speak negatively, you can tie their “hands”, keeping them from helping you. Who doesn’t like to hear ‘Thank you!’ when you’ve done something good for someone? A spirit of gratitude and words of thanksgiving bring a smile to God’s face. It is good to give thanks unto the Lord morning and night (Psalm 92:2). It is our choice to do so. (Leviticus 22:29). To not give thanks unto the Lord, to be ungrateful, can lead to dire consequences (Romans 1:21). The back panel of the pamphlet provides the Scriptures giving the “why” and “how” to receive Jesus Christ as Savior and Lord. God’s Word is full of promises for the believer and follower of Jesus Christ, God’s Son. God always keeps His promises. 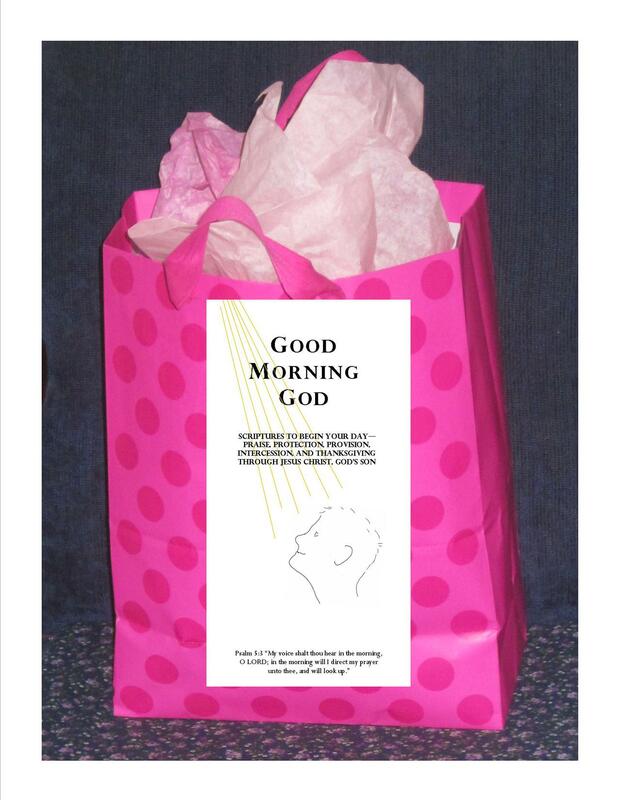 This link should take you to the pamphlet,Good Morning God-Revised-2015-with contact information . Feel free to read and download (or is it upload? ), and share. God’s blessings to you and yours. This entry was tagged forgiveness, gift, Good Morning God, Jesus, Therese Marszalek. Bookmark the permalink. Awesome Word, Patty. What powerful truths to keep in front of us daily. Thank you for sharing your heart and sharing God’s Word. YOU are a gift!